Freshman forward Alex Debayo-Doherty made a quality first impression at Harvard, as he scored in his first collegiate game. 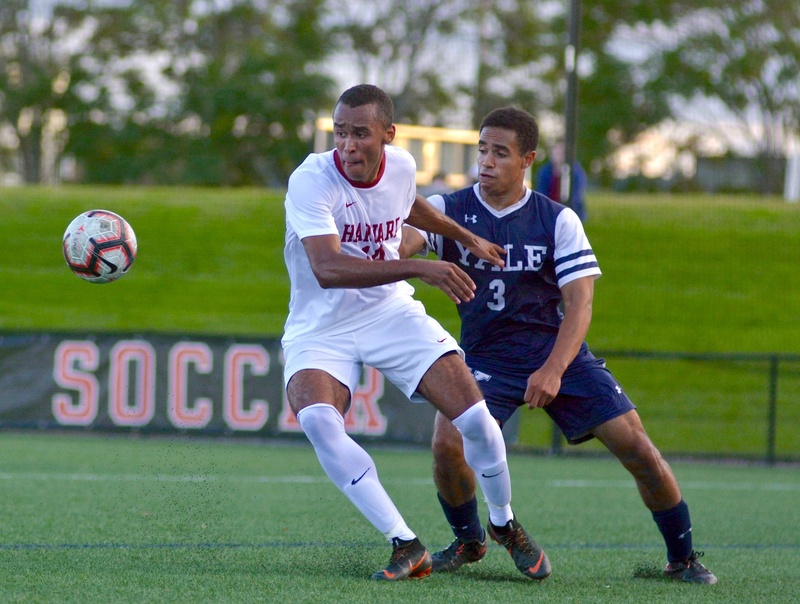 Coming off a win against Yale in its first conference matchup, the Harvard men’s soccer team (3-6-0, 1-0 Ivy) is looking to nab another victory in its next Ivy League contest against Cornell (7-2-0, 1-0) this Saturday. Harvard certainly brought that mentality to the match against Yale last week. Despite starting the game on its heels, the Crimson jumped ahead with a 59th minute goal netted by freshman forward Alfred Perez and didn’t look back, securing a one-nil victory at full time. The shutout victory against the Bulldogs extended Harvard’s win streak against its archrival to five games and was the Crimson’s first clean sheet of the season. This marked a significant defensive improvement over the first seven games of the season in which Harvard allowed an Ivy League high of 19 goals. And the turnaround could not have come at a better time. With the home win versus Yale, and another victory at home against Boston University in the game before, the Crimson snapped a four-game losing streak. Freshman Havard Hjermstad credited the defensive success to the formation changes that new additions to the coaching staff implemented this year. The Harvard squad will have to keep that defensive prowess rolling against a rather formidable opponent this weekend. The Big Red has the best overall record in the Ancient Eight, and is currently ranked 25th in the country, the highest ranked Ivy League team on the NCAA list. Cornell is also coming off a 1-0 shutout victory against Penn in its first Ivy League win. That victory prolonged what has become a four-game win streak for the Big Red, with alternating home and road contests. Cornell’s high-powered offense has put up 18 goals this season, leading the Ivy League by a long shot. The offense has been led by freshman midfielder Emeka Eneli, who has put up a goal in five of the Big Red’s nine contests this season, a team high. When Harvard matched up with Cornell last year in Ithaca, the game was a nail-biter. If not for a ninth-minute goal scored by George Pedlow, a forward hailing from London, England, the game very well might have ended drawn, as the remaining 81 minutes were scoreless. Pedlow, now a junior, is another player on Cornell’s team to watch. He has found the net three times this season, putting him behind Eneli with the second most goals scored on the team. On the Harvard side, senior forward Cesar Farias Jr., Perez, and Dogan have been leading the offense with two goals apiece. Additionally, sophomore midfielder Paolo Belloni-Urso has recorded three assists on the year. After dropping an excruciatingly close 1-0 contest to New Hampshire on the road, these players are hoping to lead the team to a bounce-back victory on home turf. Jordan Field has seemed to electrify Harvard this season. The team has an 0-5 record in away games this year but is sitting at 3-1 at home. Adding to the significance of this particular matchup is that it is being played during alumni weekend. Entering its penultimate regular season matchup with a three-point lead in the Ivy League table, the Harvard men’s soccer team has the opportunity to clinch its first Ancient Eight title since 2009 with a win at Jordan Field on Saturday against visiting Columbia.